Once I started exploring slipped stitches to knit easy two color patterns, like the one I shared yesterday, I basically couldn’t stop. I’m sure it’s been done by others, but I “un”-vented this cool pattern. I’m calling it mock houndstooth. You can see it worked up in 2 colors of Deluxe DK Tweed Superwash. This two color pattern is now ubiquitous to the fashion industry, but for many it evokes mental images of hunting on the Scottish moors, or strolling along Paris avenues with socialites. Designers use the stark, high-contrast black and white version at many different scales; tiny, fine tweeds and oversized jagged checks are in vogue pretty much every year in some collection or other. This weave can be traced back to the early 1800s and was commonly worn as woven wool outwear by Scottish sheep herders, but by the early 1900s, many designers adopted it for business and evening wear. I really like houndstooth, but to knit it as it appears above involves a lot of work with stranded colors or intarsia, techniques not everyone is ready to dive into when they feel ready to try a houndstooth pattern in a scarf or cowl. Yesterday’s swatch with the 2-color tweed got me thinking, and I tried a variety of times to get a houndstooth look using the same easy slip stitch 2-color knitting technique I demonstrated yesterday. To make this pattern you need a multiple of three stitches, plus 2 for symmetrical edges. I used 26 stitches for this swatch. Rows 1 & 2: With MC, knit. Row 3: With CC, k1, [k2, sl 1] across to last st, k1. Row 4: With CC, knit. Row 5: With MC, k1 [k1, sl 1, k1] across to last st, k1. Row 6: With MC, knit. Row 7: With CC, k1, [sl 1, k2] across to last st, k1. Row 8: With CC, knit. Row 9: With MC, k1, [k2, sl 1] across to last st, k1. Row 10: With MC, knit. Row 11: With CC, k1 [k1, sl 1, k1] across to last st, k1. Row 12: With CC, knit. Row 13: With MC, k1, [sl 1, k2] across to last st, k1. Row 14: With MC, knit. Repeat Rows 3-14 for pattern. My swatch is about 4¾” [12cm] across, so 26 stitches are not enough for a man’s scarf, which is what I’d like to knit with this yarn. I think I’m going to go up to 47 stitches, which will yield about 8″ [20cm] in width. I’m going to knit until the two balls of yarn run out. I’ll let you know how long it ends up being. 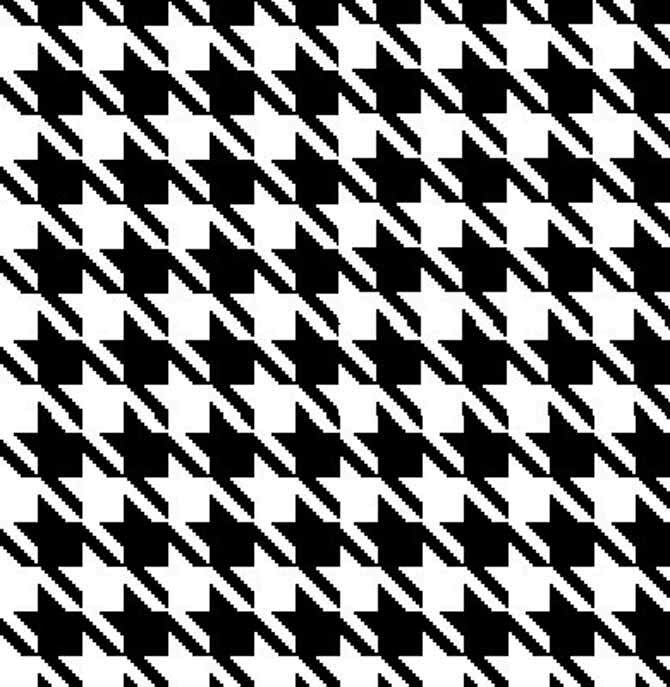 Another thing I may try is to work the following pattern to see if I can get the diagonal slant of the 2-color mock houndstooth to change direction. Rows 1 – 14 as above, then work the odd rows in reverse order from Row 11 to 3. Please share photos of your swatches or projects if you try this pattern out.